I took this picture off the bridge at Cedar Run looking South. It was getting a bit dark so it is a little hard to see the color changes, but they have already started. Seems like many of the trees are changing and losing their leaves quickly so I am not sure the fall color will be very good this year. The creek is very low and you can walk across it almost everywhere. We have had a very dry summer and so far the rain we get has been light. The second picture is something I found funny. 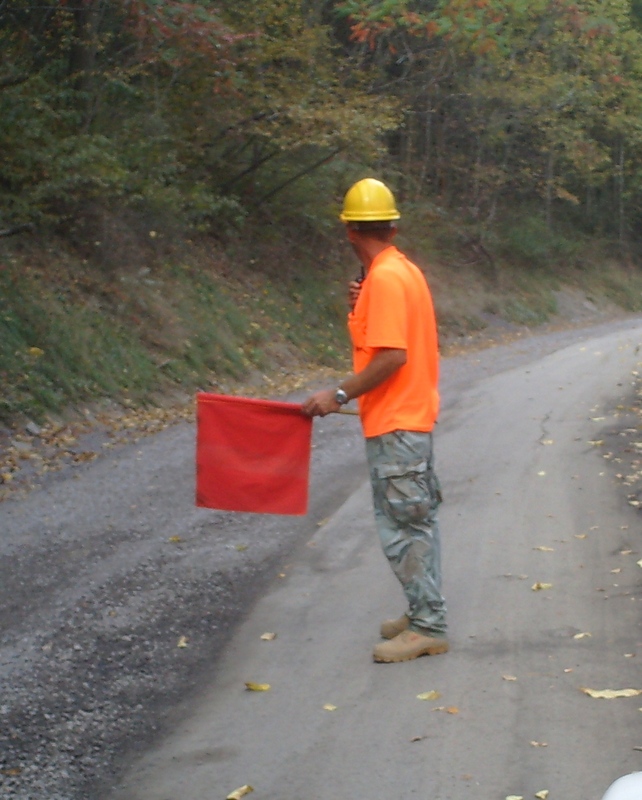 As I was driving in to get some lumber, a flagman stopped me for some road construction. I couldn't help but laugh and the combination he wore. pants were camouflage. Clearly, a contrasting message did he want to be seen or not? The conclusion is up to you. I did ask him about his attire and his reply was: "They only said I had to wear this top." This one will go under my file, "Only in the Pennsylvania wilds." Lee didn't think this was as funny as I did. Guess I am easily amused. Well, its back out to cut firewood. Mountain girl, Paula, logging out. Lee, I and my mom who is visiting from Iowa went to Williamsport today shopping. While we were there a bad thunderstorm hit with high winds. 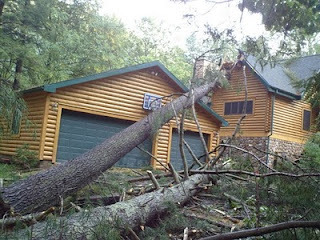 My thoughts always start thinking about getting back to cabin.I didn't bring the chain saw and knew if the winds hit at home as strong as Willliamsport, I might have problems getting back. As we were traveling up 414 after Waterville and just before we got to Jersey Mills we saw Mariano's log cabin holding up a couple of white pines. Since they were there I stopped and asked them about it. 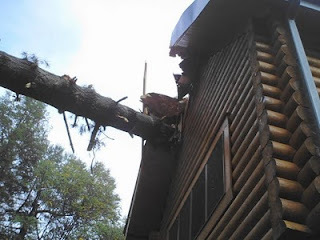 Mr. Mariano said he had been at a doctor's appointment when Johnny Stoltzfus saw the trees on his house and called him. Mr Mariano's believes if his house would have been anything but full logs it would have given way to the weight of the trees. The tree trimmers were on their way to remove the trees when I took these pictures. As we came farther North there seemed to be less debris on the road and nothing for us to remove all the way home. Ron, my step dad who had stayed at home said we had hardly gotten any rain and no wind. You never can tell even in a short distance here about the difference in weather. But I was happy to get home without a hitch. Mountain girl, Paula, logging out. 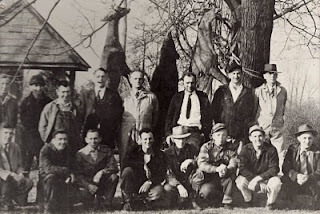 It was around 1933 during the great depression that so many of the hunting camps got their start here in the Tioga Forest. Where else could you lease some land to build a camp on for $10 a year. Hunting provided food during the depression to many a families and cheap meat was a welcome addition to the diets of many. 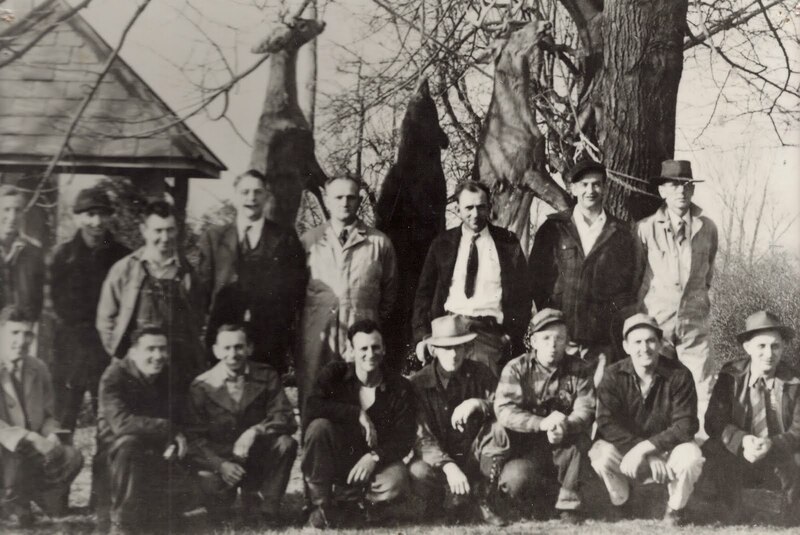 Of course chasing a big buck or bear through the woods and mountains did add a bit of fun and danger to getting meat for the family, which drew men and women who loved adventure. Abe Grube was born in 1896 in Lititz, Pa. His dad owned a farm that had been handed down from a grant by William Penn. The farm life wasn’t adventurous enough for Abe and at eighteen he packed up and jumped a train to Illinois where he worked on a ranch until he was drafted for WWI. He went home so he could deploy from there. It was not to be though the war ended three weeks before he had to leave. So he went back to helping his dad on the farm. The Fish Peddler shook his head. “Where’s that?” The fish Peddler asked. The fish peddler had Abe’s interest. “How do you get to this Leetonia?” Abe inquired. 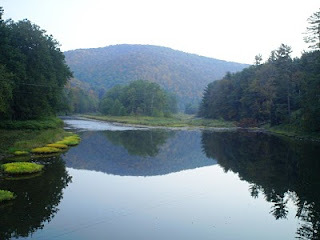 “Well ya go up 287 to 414 to Cedar Run then follow the creek up Leetonia is about 7 miles up the creek, but there is a nice camping area up about three miles on the left. It has a little pavilion and water for campers.” (This area is just to the North of the intersection of Fahneystock and Leetonia Roads on the creek side of road. It was closed sometime in the 70’s or 80’s). The seed of adventure planted; Abe, Abner and Wayne Grube make the trip up to the Leetonia area. Their truck splashed through cedar run creek as they made their way up the rough road. In the dark, Abe the camping area and waited for light to see if the Fish Peddler had been right. When light came into the canyon area he noticed a nice trout stream and two steep mountains on either side of him. Down the road a bit was a camp called Blossburg(now the Nightengale) and not strangely enough the men were from Blossburg and new the area well. They helped Abe and his brothers explore the new found area. It was rough climbing those hills to find game and well worth the effort. Bear, turkey, deer and trout abounded. Abe knew he found his place. Abe’s brother Abner owned a garage in Rothsville. Many young men hung around the garage and they had one thing in common they loved adventure and hunting. It wasn’t long before there was band of twenty camping in tents for three years in the hollow below Fahneystock road. (First Picture) It gets cold here during hunting season and I am sure no one dared to complain or they would sounded like a weakling. Abe had noticed a pile of wood near an area up the Fahneystock Road. It looked like someone had started a camp and never finished it. So when the game warden came by Abe asked him about it. This was too good to be true, Abe thought. The Warden walked off a square plot of land or as near square as you can without a transit. He put up stones in the four corners drew up the permit to lease and took Abe’s ten dollars. In the Oct of 1937 they were ready to build. Each of the twenty men chipped in $35 to buy materials. Supervised by Wayne Grube a carpenter, the project moved quickly. On the first day, twenty men had the floor and walls up before it got dark. The country was still suffering from the effects of the Depression so money was tight. The single men who didn’t have families to support were able to get a room at the Cedar Run Inn, but the married one got the second option sleep on the floor they just finished. When they awoke in the morning they had two blankets on them one was white and cold. They had one of our October snows. After a morning fire and some food the work resumed and the cabin was buttoned up with a roof. Shortly after the building of the camp many of the young men were drafted into the Second World War. They picked up some older members to fill the roster. 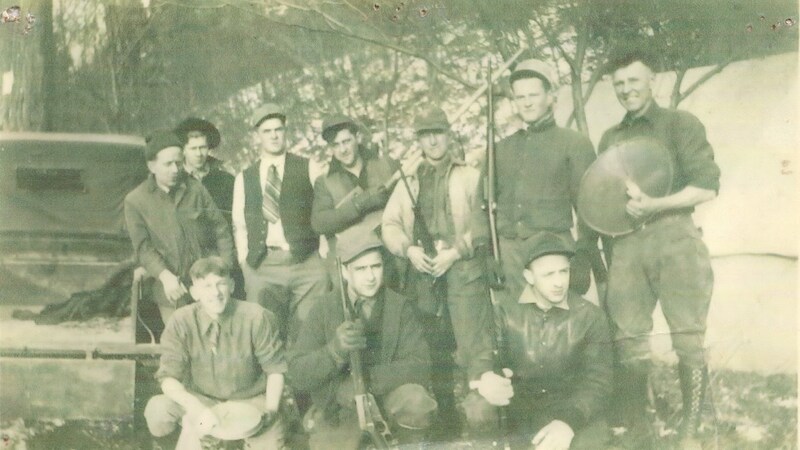 Most of the men had shotguns as few could afford a good gun. Abe knowing that wouldn’t do went out and bought two 30-06 Springfield rifles for $90. The guys took turns using them. In fact, the first bear was shot with one of those guns by Landis Mull. The older members are shown in the group picture of the bear sandwiched between two deer. This picture was taken down state were they would butcher the animals they shot during hunting season. Members have changed over the years. Bear Mountain could only hold twenty members. People unable to get into Bear Mountain camp built new camps during the time leases were still being offered. So in a way one person’s dream sprung many branches in these mountains. One thing has stayed the same everyone who comes up loves these mountains, the challenge of hunting them, or just enjoying a few moments of silence. The camp now has a phone and electric, but still sports the outhouse as per regulations of leasing from the State. No septic or well can be drilled on State leased camps. Bear Mountain enjoys a spring, which like many camps gives them enough water for cooking eating and the occasional bath. Bear Mountain started as and adventure and continues to be for the adventurous at heart. The Beagle was found by a couple lost girls who also found their way. Sam sure was happy to find the beagle. We appreciate him letting us know. Thanks. Sam Miller lost his beagle dog yesterday near the Beecher Hollow area up Painter Leetonia. Its a male no tags. If you see it contact me immediately. It is tough to loose your dog up here. So many things for a dog to get into trouble with and so few people to help. This is one of the pictures given to me by John Grube. He believes this is Gene Garber walking on the top rail of the bridge over the swimming hole in front of the Nightengale Camp. 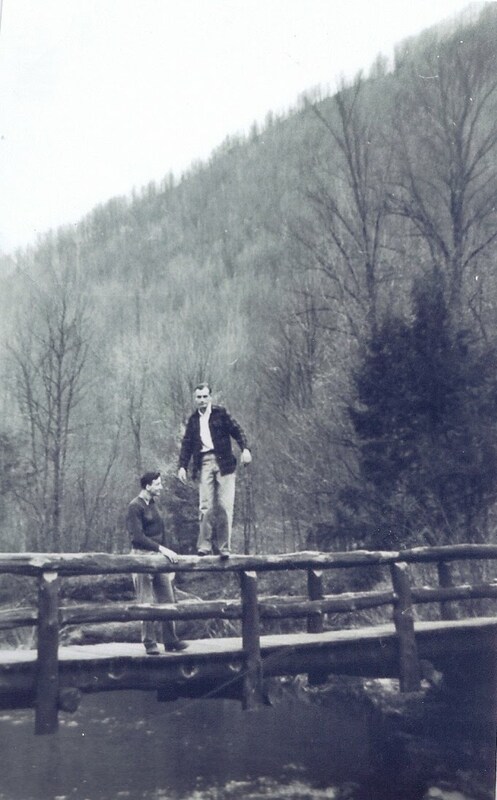 He wasn't sure who the other person was standing on the bridge. This bridge disappeared right about the time of hurricane Hazel in 1954. Unfortunately, it was never rebuilt. It was originally built by the CCC in the 30's. I still think it is about time for another CCC to restore some of these treasures and improve our roads, and trails of the State Forest. Mountain girl, Paula, logging out.